Will there really be a pensions spending spree? “UK prepares for pensions spending spree” “House prices set to soar by 30 per cent as savers raid pension funds” These were some of the headlines which followed the pension reforms announced by the UK government in the 2014 and 2015 Budgets. But how much truth do they contain? In contrast to some of the headlines, results from a household survey commissioned by the Bank suggest that greater pension freedom will have only a small impact on household spending. And – although a number households would like to invest funds withdrawn from their pension in property – only a subset of these are likely to be able to afford to do so, and some may have bought property even without the reforms. What changes have been made to pension requirements? Proposals announced in the 2014 Budget removed the requirement for people with defined contribution (DC) pensions to buy an annuity at retirement. Previously, many people with a DC pension had to use their pension pot to buy an annuity by the age of 75, or else pay 55% tax rate on the withdrawn income. These restrictions were removed from April 2015, meaning that retirees are able to access their full pension pots once they turn 55 – taxed at their marginal rate. The March 2015 Budget announced further reforms to the annuities market. From April 2016, people who are already receiving income from an annuity will be able to sell that income to a third party, subject to agreement from their annuity provider (who is under no obligation to consent). The lump sum can be taken directly or drawn down over several years, and would be taxed at their marginal rate. Around 320,000 people – or 0.6% of the adult population – retire with a DC pension each year, and could potentially benefit from not having to buy an annuity. And of those who have already retired, around 6 million have annuity policies currently in payment which they could sell. Most people’s defined contribution pension pots are fairly small, however. 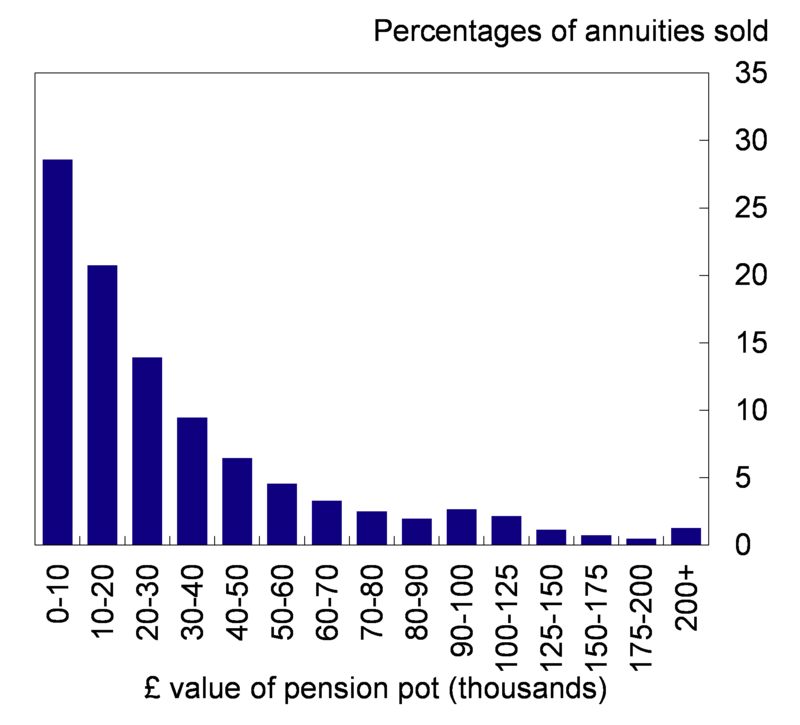 Data from the ABI show that around 80% of individuals who bought annuities in 2013 had a pension pot of less than £50,000, with only 4% having pots worth over £125,000 (Chart 1). How will the pension reforms affect the economy? There has been a wealth of speculation around the likely impact of the pension reforms. Two of the big uncertainties relate to the number of people who will take advantage of the reforms and what they will do with the cash that they withdraw. To help investigate this, we included a set of questions in the spring round of the NMG Consulting survey, which was a survey of 6000 households conducted on behalf of the Bank between 21 April and 6 May. More details about previous waves of the NMG survey can be found in the 2014 Q4 Quarterly Bulletin. Awareness of the reforms is high and they are likely to prove popular, particularly the removal of the requirement to buy an annuity. 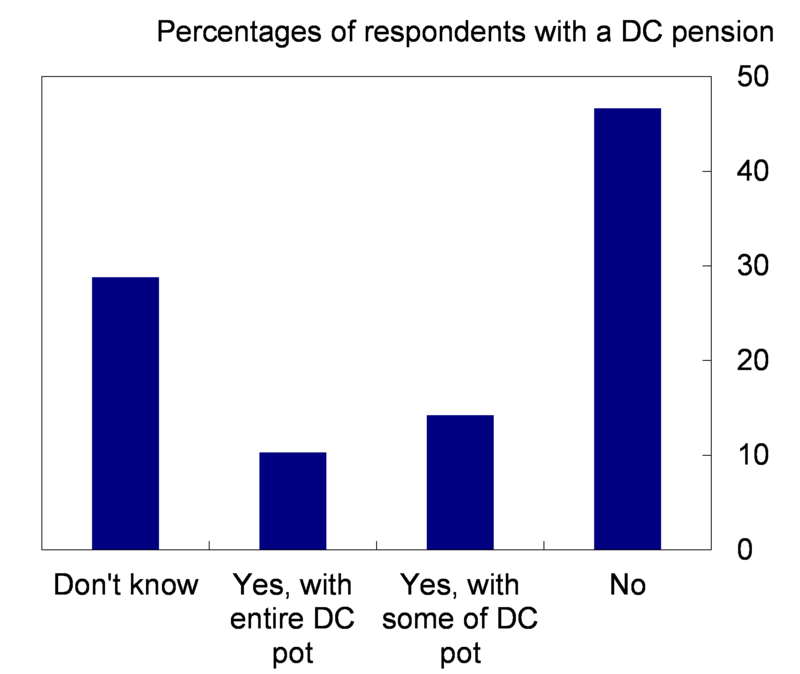 81% of respondents with a DC pension considering retirement within the next three years were aware of the reforms. Almost 50% (which equates to approximately 150,000 people a year) expected to take advantage of the new flexibility by not buying an annuity at all when they retire, with a further 30% still undecided (Chart 2). There is likely to be little impact on retirement dates: 14% of respondents thought that they would retire earlier as a result of the reforms, and 12% would retire later. 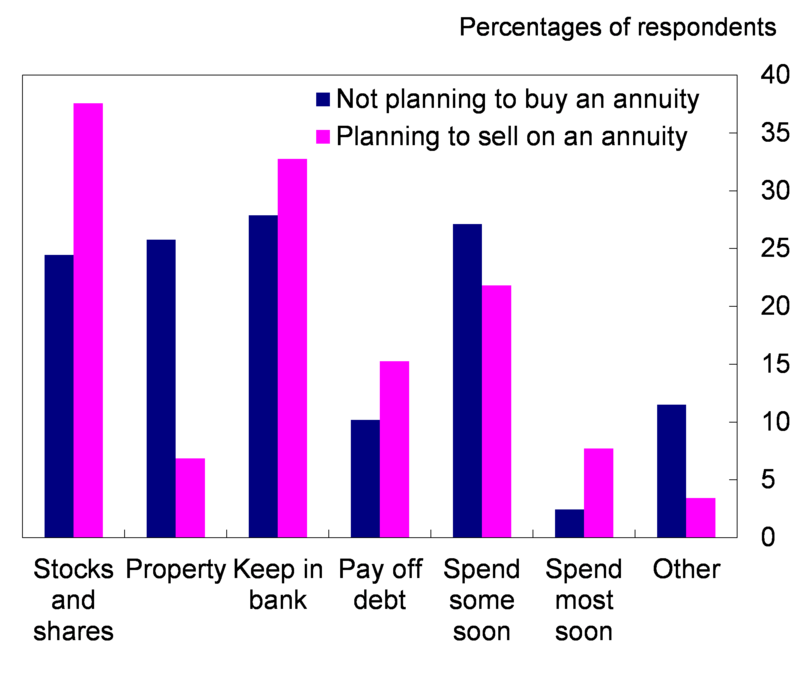 A smaller proportion of those who have retired would plan on selling their annuity – only 11% (Chart 3). If spread over three years, that would imply 225,000 people a year selling their annuity (675,000 in total) – higher than the number of people not buying an annuity when they retire because the number of people who are already retired is very large. Despite high take-up rates, the pension reforms are likely to have only a small effect on household spending. 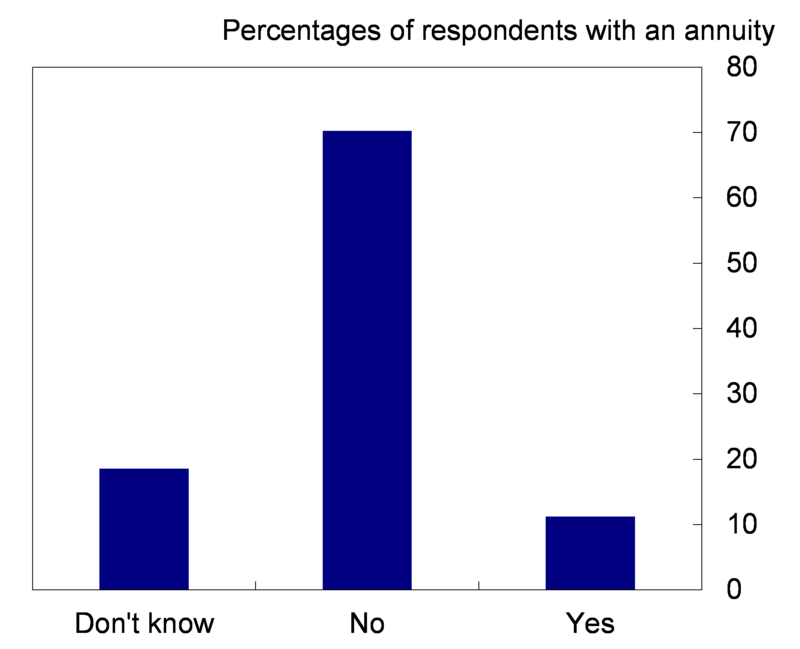 Of those planning to take advantage of the reforms, around a quarter of respondents would spend some of the money soon after it is released, and only a small proportion would spend most (Chart 4). We can use these results to make a rough calculation of the impact of the reforms on overall household spending. Given that the average pension pot of someone retiring with a DC pension is worth around £35,000 and assuming that the average annuity already in payment has a net present value of around half that, around £13 billion a year could be withdrawn (assuming that those who are undecided behave like those who are; people who want to sell back do so within 3 years, and a few other simplifying assumptions). Assuming that those households who say they will spend ‘most’ of the pension pot will spend 75% of it, and that those spending ‘some’ will spend 20% of it (both with a 20% marginal tax rate on the withdrawal) implies an increase of around £880 million a year in consumer spending. £880 million a year of extra spending sounds like a lot, but is not that big relative to annual household spending in the economy – only 0.07% to be precise. Of that, 0.04% comes from those not buying annuities and 0.03% from those selling them on. These numbers shouldn’t be taken too literally since they are based on a small sample and a number of assumptions. But they do help to illustrate that – given the number of people who are likely to be affected in any one year – these households would have to make very large changes to their spending patterns for there to be a sizeable macroeconomic impact. A quarter of survey respondents nearing retirement who do not expect to buy an annuity with their full DC pot said that they plan to invest in a property (Chart 4). That is equivalent to around 50,000 people per year. The numbers are smaller for those planning to sell annuities on: around 7% plan to invest in a property – equivalent to around 15,000 people a year if spread over three years. An extra 65,000 people a year wanting to buy property is sizeable and could have an impact on house prices: it is equivalent to around 5% of all the houses sold each year in the UK. But there is a question around how many of these people actually end up buying a property – partly because some people would have bought one anyway and partly because some of those who would need to borrow extra money to do so may struggle to qualify for a loan. First, those with big pension pots who would buy the house outright with the money they withdraw. As mentioned above, only 4% of annuities purchased in 2013 were worth more than £125,000. As an upper bound, if all of those people wanted to buy property in cash with their pension pot, that could account for 13,000 of the 65,000 extra transactions. Second, households with substantial other assets that they could combine with money withdrawn from their pension pot to buy property outright. Around half of respondents planning to invest their pension in property had other financial assets worth £125,000 or more (not including their pension and mostly in the form of deposits), which when combined with a more modest pension pot would be enough to enable them to buy a property. But most of these people could have bought property outright even without using their pension pot. Third, those with smaller pension pots and fewer other assets who will need to borrow. To qualify for a buy-to-let mortgage they would be likely to need another source of income worth at least £25,000 a year. Importantly, those with at least £20,000 a year of ‘secure income’ already had full flexibility over how they used their DC pension pots and so could have used their pension pots anyway. And those without that other secure income stream are unlikely to qualify for a buy-to-let mortgage. So it seems unlikely there will be a huge increase in buy-to-let lending on account of the reforms. In contrast to some of the headlines surrounding the recent reforms, results from the NMG survey suggest that greater pension freedom is likely to have only a small impact on household spending. There could be a larger impact on property investment, but many of these households could have invested in property anyway. And for those relying on obtaining a buy-to-let mortgage, some of their aspirations may prove to be unrealistic. Philip Bunn and Alice Pugh work in the Bank’s Structural Economics Analysis Division. Previous Post Is starting a new market like opening a nightclub? Next Post Does oil drive financial market measures of inflation expectations?